The new report by Zion Market Research on the “Neuroscience Market — Global Industry Analysis, Size, Share, Growth, Trends, and Forecast 2016 – 2024" has a vast information about the market and its potential. 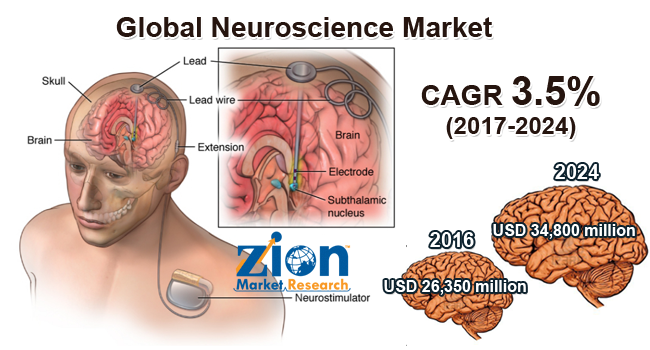 The global neuroscience market was valued at around USD 26,350 million in the year 2016 and it is expected to reach approximately USD 34,800 million by 2024. The global neuroscience market is expected to exhibit a CAGR of more than 3.5% between 2017 and 2024. The increase in the number of central nervous system (CNS) diseases and the growth in the advanced technological advancements are the primary factors that are driving the neuroscience market. Other factors that are expected to drive the market growth positively are favorable reimbursement policies and the growing government spending on the healthcare infrastructure. Our research analysts observed that the neuroscience market will experience a rapid development in the coming years. Increase in the number of the organizations and institutes that are majorly focusing on the development of neuroscience has accelerated the research and development. Some of the organizations and the institutes that are already majorly contributing to the developments in the field of neuroscience are NeuroScience Canada, Ontario Brain Institute, NIH, and other universities. Hospitals segment anticipates holding a major share in global neuroscience market by end-user type owing to increasing cases of CNS-related diseases and rising diagnosis ratio. Furthermore, rising awareness among the population and high demand for neurological diagnostics in hospitals are other factors that are driving the growth of hospital segment during the forecast period. Diagnostic laboratories segment accounted for the second largest share in global neuroscience market by end-user. Increasing concerns about the prevalence of various diseases and advancing technological infrastructure to provide more precise diagnostic results to meet the unmet need regarding CNS disorders will fuel the diagnostic laboratories segment during the forecast period.